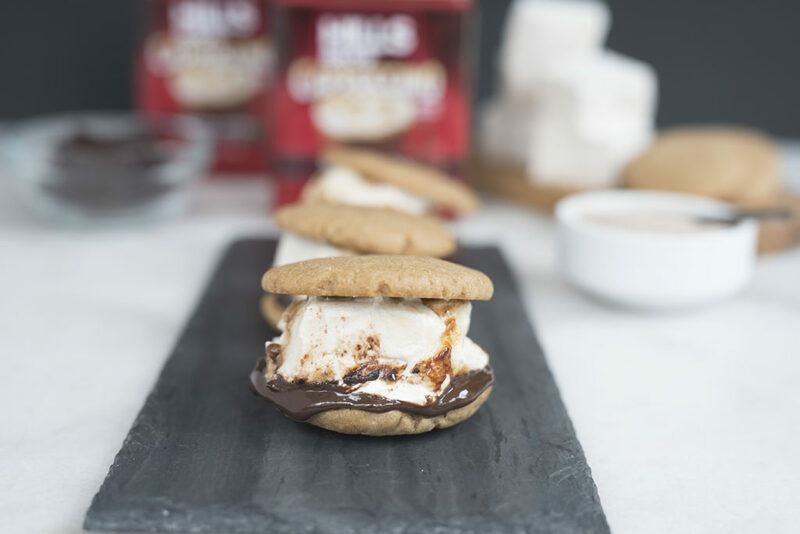 05 Sep Fancy Cappuccino Flavored S’mores Recipe! Camping was a tradition in my house when I was growing up. We would pack up our camper and head out of town for a relaxing weekend filled with lots of food and the fresh outdoors. Sometimes we would travel only an hour or two away from home and others we would cross lots and lots of state lines. 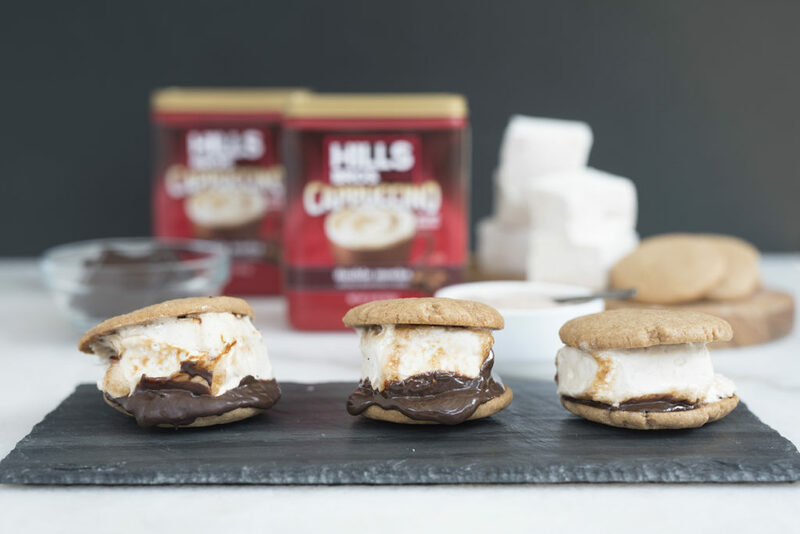 Wherever we went camping, one thing was always guaranteed – after the day was done we’d sit next to the first and roast up marshmallows until they were warm, gooey, and perfect for a s’mores. 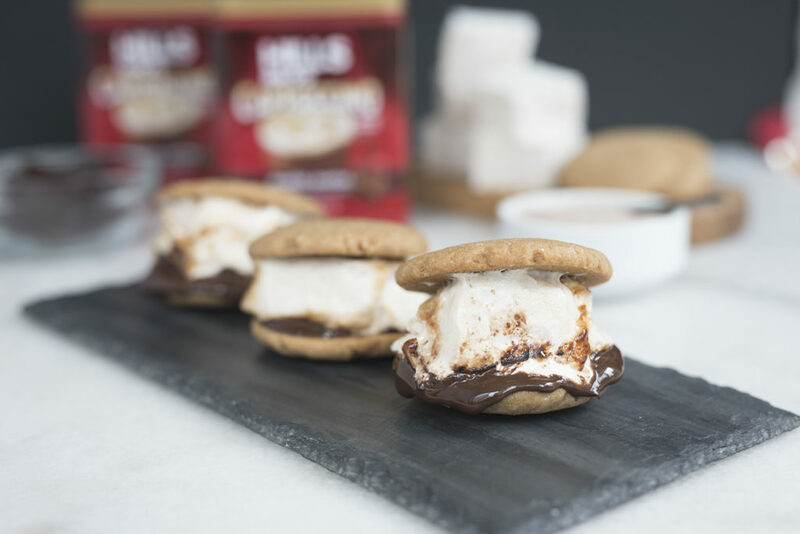 For this recipe, I wanted to give the traditional s’mores a twist by adding flavor to the cookies and marshmallows. 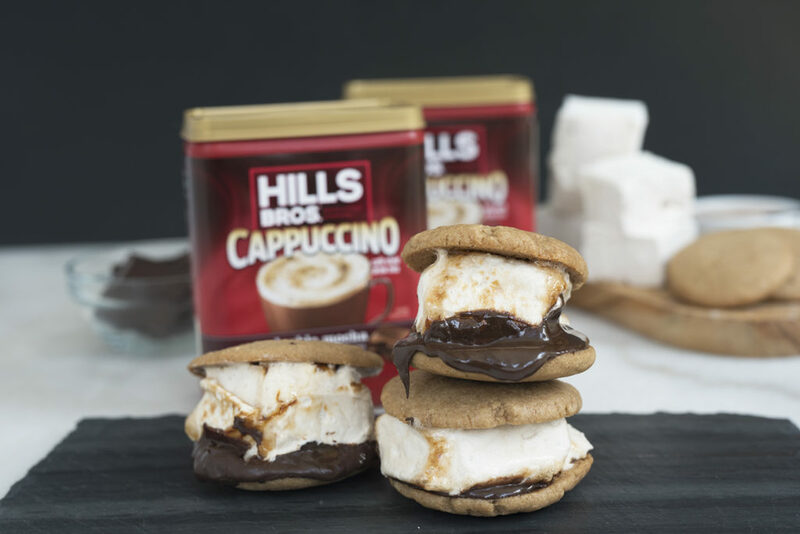 The result – a double mocha cappuccino s’mores! If you are a chocolate lover then this has your name written all over it. Instead of using graham crackers, I opted for soft sugar cookies with cappuccino flavoring. The cookies smell SO good when you are baking them. I thought I was working in an artisanal coffee shop when they were in the oven! I then whipped up a batch of homemade pillowy marshmallows and sandwiched them between the cookies with delicious dark chocolate. 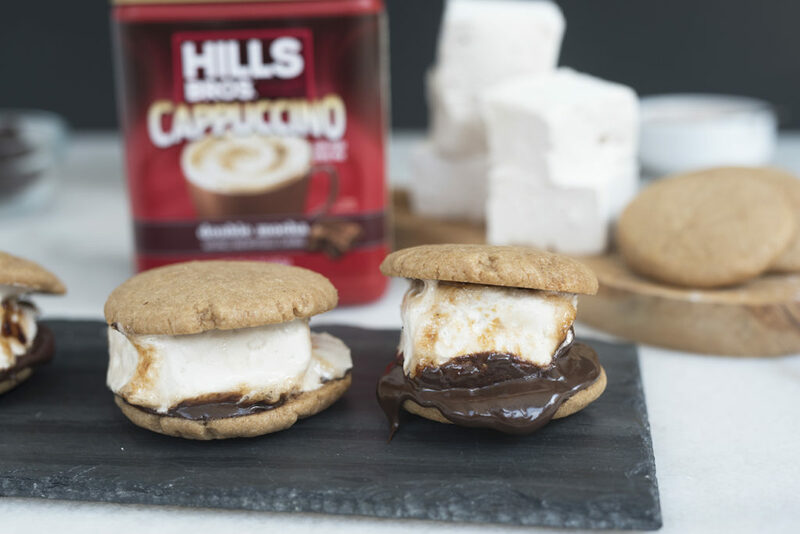 Read on below if you want to give your classic s’mores a little cappuccino twist! Recipe for cookies and marshmallows below. Prepare an 8×8” square baking dish by covering the bottoms and side in parchment paper. You want to make sure the parchment paper is large enough to hang over the sides for easy removal. Lightly grease bottoms and sides with vegetable oil. In a medium saucepan, combine sugar, corn syrup, salt, cappuccino mix, and 6 tbsps of water. Place on medium heat and bring to a boil. You will want to stir frequently at this stage to help dissolve the sugar. Once it reaches a boil, let the mixture cook until it reaches 238 degrees F on a thermometer (approx. 7-8 minutes). In the meantime, in the bowl of a stand mixer add the gelatin packs and remaining 6 tbsps of water. Give it a quick stir to combine the two ingredients and let sit for 5 minutes to soften. Once the sugar mixture has reached the appropriate temperature, slowly pour the mixture into the gelatin mixture. Use the whisk attachment on low speed to combine the ingredients. 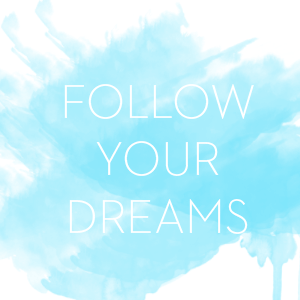 Gradually increase your speed until you reach high speed. Be careful as the sugar mixture is fairly hot so you will want to slowly increase your speed over time to avoid splashes outside the bowl. Beat until stiff (approx. 10 minutes). When the mixture is stiff, transfer to the prepared pan and spread with an offset spatula. Let it sit to harden for at least 4 hours. 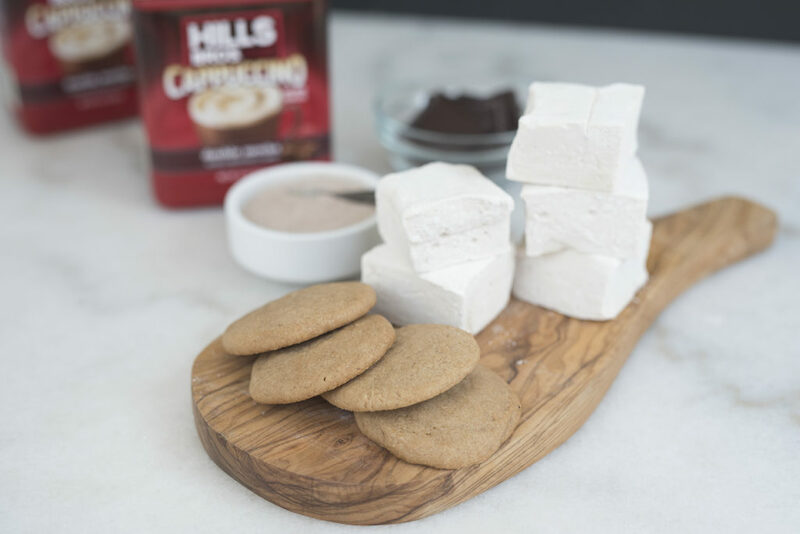 Once the marshmallows have firmed up, remove them from the pan and place on a clean work surface that is generously dusted with confectioners sugar. Dust the tops, side, and bottom of marshmallow square. Then divide into 20 marshmallows (4 cuts across and 5 cuts down). 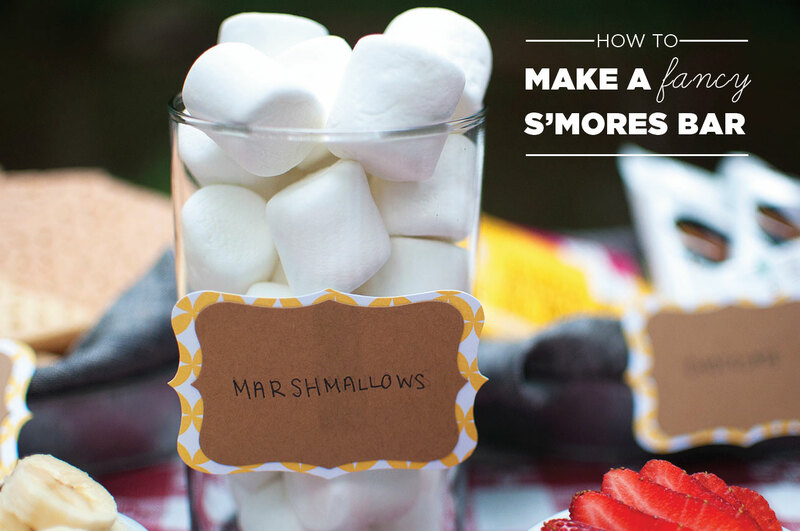 Dust each marshmallow in confectioner’s sugar and then they are ready to consume or use for your s’mores! 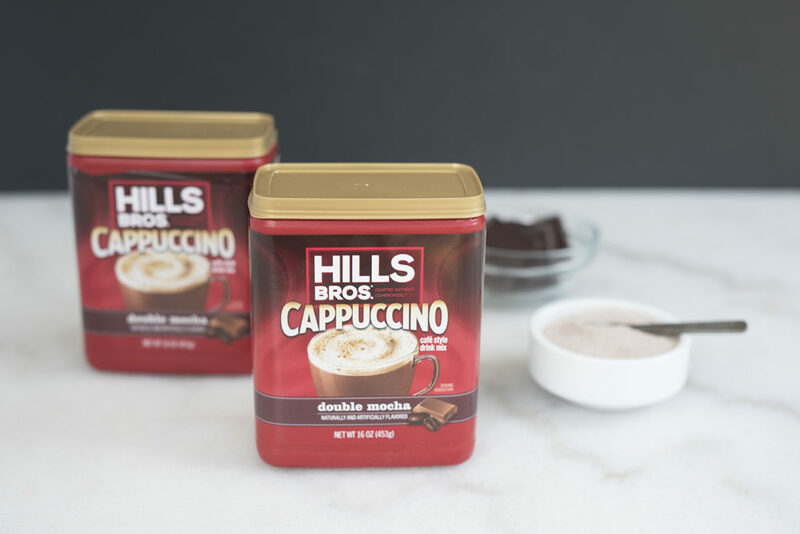 In the bowl of a standing mixer, combine butter, granulated sugar, egg, and cappuccino mix. Mix until completely incorporated. In a separate bowl, combine the flour, salt and baking powder. Add the dry ingredients to the butter mixture and mix until a dough forms. Once the ingredients are fully combined, remove them from the bowl and place on top of plastic wrap. Form the dough into a flatten disk and wrap in plastic wrap. Place in refrigerator and let chill for 1 hour or until the dough is firm. Remove the dough from the refrigerator. Take of a tablespoon of dough and roll it into a ball. Place it onto a baking sheet lined with parchment paper or silpat and use the flat side of a cup or jar to flatten the ball. Place baking sheet into the oven and bake for 14-15 minutes or until the cookies start to turn brown at the edges. 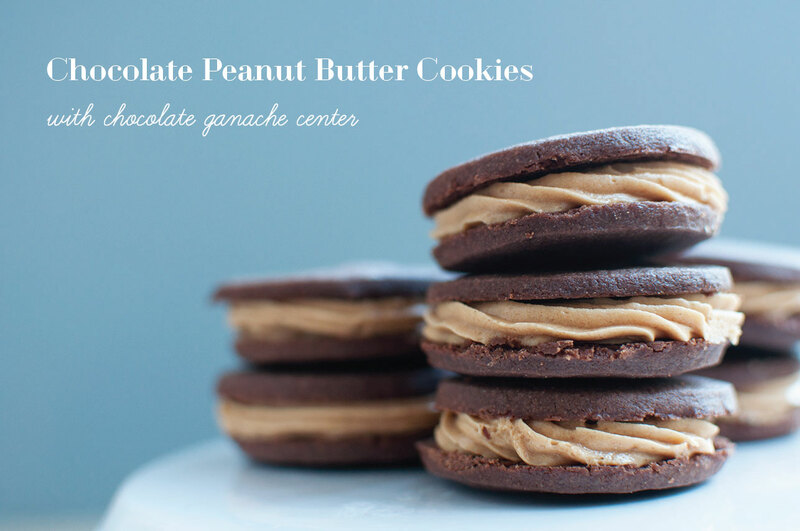 Remove them from the oven and set them aside on a cookie sheet to cool. To assemble the s’mores, place a marshmallow on a fork and roast over an open flame until it starts to brown on the edges. Place the marshmallow on the flat side of a cookie. 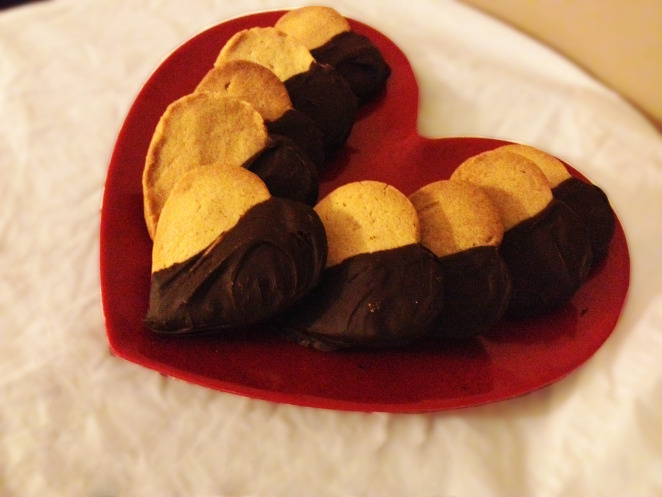 Place a piece of chocolate or a chocolate spread on the flat side of a second cookie then bring the two cookies together like a sandwich. Enjoy!